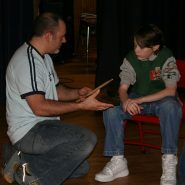 Drumming can be used as a tool to teach an array of life skills. It provides a positive and creative outlet for young people to express themselves and release their emotions in a safe space. I often refer to the drum as my “trash truck” and “most reliable friend” where I can release (or dump out) emotions and energy created from the many challenges life presents. The drum is a place where I can escape into a world where the limitations of words aren’t present, and I can feel more than think about what I want to say. Josh Robinson grew up around the music business and began playing pots, pans, and eventually drums in his basement at an early age in his hometown of Woodstock, NY. In 1989 he joined “Sankofa” Afro-Brazilian drum and dance ensemble, where he was introduced to the instruments and rhythms of Latin/Caribbean music. 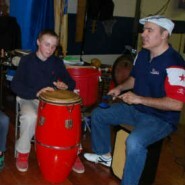 The rhythmic quest has taken him to countries such as Cuba, Brazil, and Panama, where he has studied with masters of percussion with a strong focus on conga drums. He studied at AMLA (Asociacion de Musicos Latinoamericanos) in Philadelphia, and has attended workshops and clinics led by masters such as Giovanni Hidalgo, Candido Camero, Zakir Hussein, Orlando Fiol, and Yaroldy Abreu Robles. He founded “Rhythms & Roots” Latin Music ensemble in 2000 with wife Giovana, and both were selected to the 2003 & 2004 Philadelphia Music Project’s Latin Orchestra, led by famed bandleader Johnny Pacheco. He performs on the Philly scene with poets, DJ’s, jazz groups, theatre/dance groups, and on a variety of other projects as hired “hands.” He attended the ATI (Artist Teacher Institute) through Arts Horizons at Rutgers University and has since been working with kids ages 5 to 85, leading workshops, residencies, professional development, school assembles, and after-school programs, where he has used percussion as a tool for teaching aspects of communication, teamwork, creativity, leadership, discipline, and cultural awareness through music and instrument making. 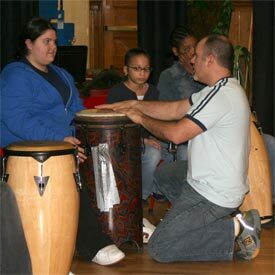 He is a New Jersey State Council on the Arts teaching artist for their Artist in Education programs.